One of the blessings and curses of being the oldest child of young parents is that you get to watch them grow up. I am old enough to remember my dad’s youthful joie de vivre. I remember visiting my dad on the jobsite when he was in his twenties, a bright bandanna tied around his forehead as a sweatband. He taught me about tools and gave me scraps of wood to practice building with. The hammers were so heavy, the bubbles in levels were almost alive, retractable tape measures were fast and yellow, and ballpeen was a hilarious word. Plywood was made of sheets of wood, with the grain going different directions to make it stronger. Sheetrock was not as strong as it sounded—just powder pressed between paper. Fiberglass insulation looked like pink cotton candy. Dad taught me how to distinguish kinds of lumber by the grain and color, and he taught me trees by leaves and bark. He pointed out the wood in furniture, pine and burl and birds-eye maple, and named the forests that blurred by in green and brown as we drove down the Washington roads. Alder grew fastest after a fire, and a maple leaf had five fingers like my hand, but Douglas fir was my favorite because it was named after my dad. 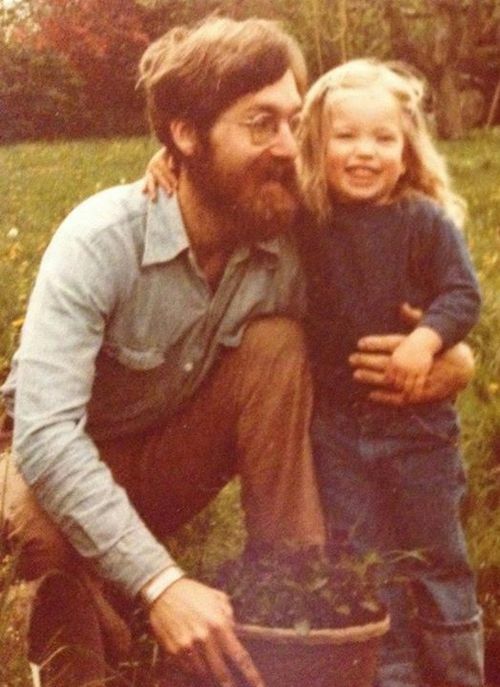 To complete his life with trees, Dad would chew on chunks of spruce gum all day and come home and wash up with pine tar soap and then build a fire of wood scraps in the fireplace to warm us all. Because of my dad we grew up with a glowing hearth with everyone gathered around it. Flames are the sun it is safe to stare at. The sound of burning wood is the rasp and whisper of a needle in a scratchy groove. By his early forties my father’s joy in life was entirely gone. He had wanted to go on adventures and save the world; to be a missionary in Papua New Guinea or Ghana, or just to be a builder someplace better. Instead he got up while it was dark and hammered nails in the rain for twelve hours, balancing our whole lives on a slick and narrow beam above a concrete slab, sometimes falling behind the bills and sometimes pulling ahead of them. When he came home exhausted he wanted, at the very least, a perfect marriage and perfect children. Instead we were seven kinds of chaos. Everything we did felt like failure, and we were taught to name the varieties of our shame like a taxonomy of trees. Then there were the years when he didn’t seem to want anything anymore. I fought with him bitterly but lived in his discarded work clothes: 3-in-a-pack V-neck T-shirts worn to transparency, Wrangler corduroys worn smooth. It was half my lifetime ago now that my dad and I converged on our lowest point. For four years we had been fighting tooth and nail, hammer and tongs. One Sunday when I was seventeen he suggested we skip church, an act of unprecedented gravity, and we walked along the gray waterfront for hours and he told me he couldn’t fight me anymore. I was free to make my own choices: to move out, date heathens, quit school. He was going to have to entrust me to God. We were both crying. In the decades since that day, my dad has become a man of legendary gentleness and belated grace—or maybe grace that came just in time. For years now, as my siblings can testify, our mere existence has been a cause for his gratitude, our smallest successes a cause for his delight. When we are wary and doubtful, he is confident we can do it. When we are hesitant to be happy, he is overjoyed for us. His kids are dating or marrying heathens in droves and quitting school at regular intervals; the moving out is happening more sporadically. We are decidedly not the perfect children he was trying to raise. But there are no children who are more steadily loved. Because of my dad, broken and mended perfectionists will always be my favorite people. This spring I was sorting through papers and I found an old note my dad wrote when one of my sisters was in the hospital. Dad’s letters look like no one else’s: he writes on yellow legal paper in a wrecked scrawl. This one said simply, “I just visited your sister. She is so much better.” The relief or willful belief in the underscore brought me to tears. I was suddenly back with him in that powerless place, watching him face his fears and cling to hope. That hope was prophetic, as it turned out. It was a lifeline and an anchor. Dad likes to take care of people. That is an understatement. When I call home and ask him how he is I always get a loving and detailed run-down on everyone else. I learn all about my mom and siblings and various family friends and then he says, “That’s enough about me. How are you?” Even during his recent years of chronic physical pain I always had to keep wresting the conversation back towards him in order to find out how he was doing. My sisters and I can tell shocking tales about my Dad’s uniquely stoical relation to the pain scale. I often have better luck asking about what he is reading: Wendell Berry, African American autobiography, G.K. Chesterton, ancient Greeks. I have been thousands of miles away from my dad for twelve years. In my everyday life I often piece together fatherly help from older friends and apartment superintendents and landlords and ministers and my overdraft account and Triple A. On this father’s day I am especially grateful for my Princeton super Larry Spruill and my church friend Jerry Cooper and the Fair Haven man who stopped on State Street last year when my car broke down and waited with me for the tow-truck and told me stories about his daughter. Still, every so often I am reminded that underneath everything I do there is fatherly love like a well-poured steel-reinforced concrete foundation. A few weeks ago I called home and my dad said he had something to tell me. Of course my first thought was disaster or disease, but I should have known better. He told me that if I wanted to be a single parent I had his blessing. That he would love my future children no matter where they came from. That it would be hard to help out from far away, but he and my mom would do what they could. I wouldn’t be on my own. Dad’s work has never gotten easier, and so far most of his adventures have orbited around the same old house in Tacoma. As his family has grown, the seven kinds of chaos have become eleven, and with entropy and more grandchildren it will only get worse. He will never be able to afford to retire, and if he’s anything like his dad and grand-dad he will live to be 95. Maybe one day he and Mom will finally flee to New Guinea or take to the sea or hit the open road in an old Ford camper van with a few old books and a stash of tea. In the meantime Dad is lucky enough to be swamped by daughters and grand-daughters and an adoring grand-dog and a tolerated grand-cat, facing the future with hard work and hope and an infuriating insistence that the Lord will provide. On rainy evenings he still comes home from work and kneels by the hearth and opens the flue and splits the kindling and arranges the firewood and strikes a match, and waits for the family to gather, and it does.